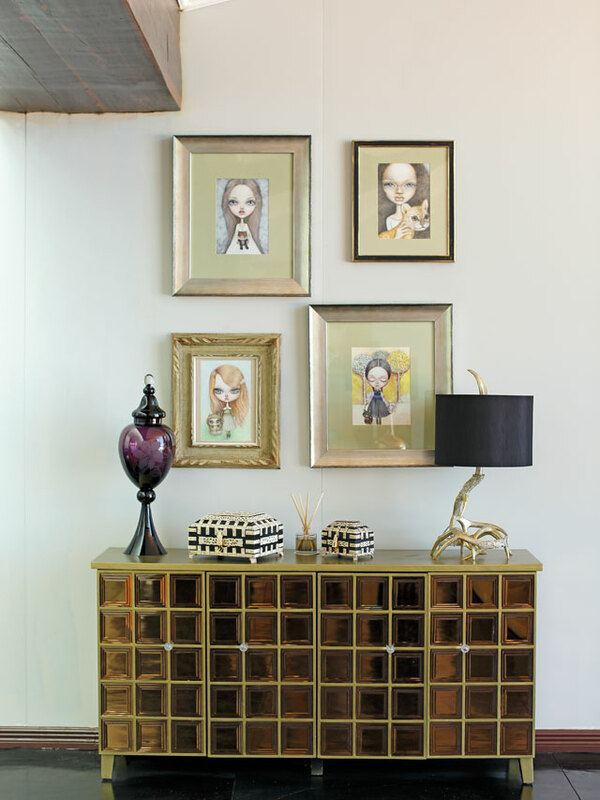 Designer pieces and prized works of art add a different flavor to any home. Whether it’s a chair, a table, or a commissioned artwork, an investment piece adds character to a space and leaves a lasting impression on guests. 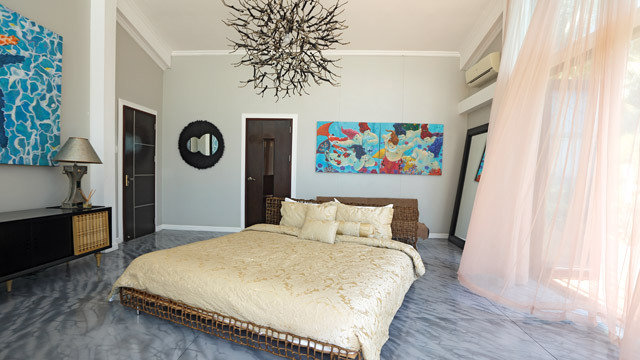 Actor and athlete Derek Ramsay is one of the many who chose to complete his properties with interesting works of art and luxe designer pieces. Here, we feature 10 photos that prove he knows how and where to invest his hard-earned money. The living area in the Palawan glass house features a mix of artwork and designer pieces. Guests are treated to a laidback ambiance that matches the home’s location. A few steps from the main entrance is a set of convex mirrors by Ito Kish from his Kish Stories from Canada line. The mirrors liven up the wall and work well with the kamagong seat designed by Derek’s mom. Look up and marvel at the piece hanging from the ceiling. A hanging lamp that doubles as artwork, the Limbo Acrobat by Kenneth Cobonpue features gossamer wires handwoven in a beautiful lattice pattern. It not only illuminates the space at night, it’s also a great conversation starter. 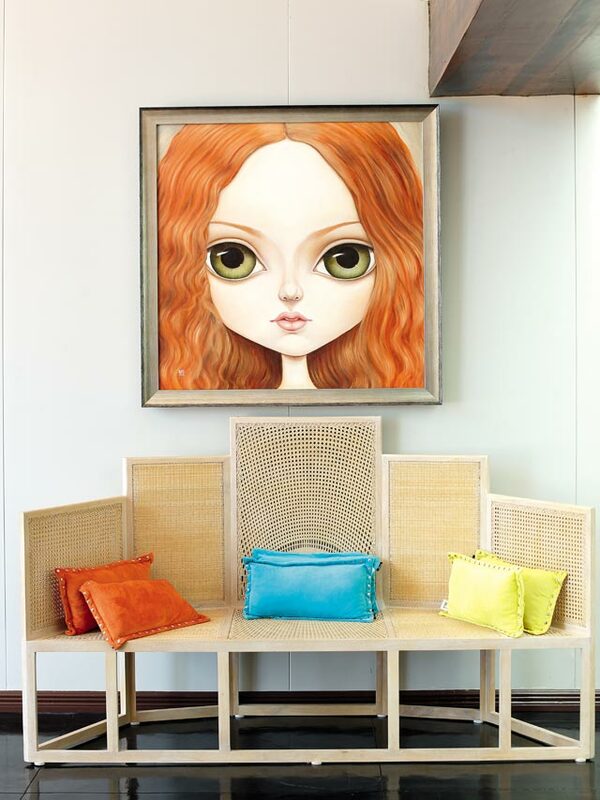 We love how the colors of Mayi Penaflorida’s Dear Bella match the pillows sprucing up the Basilisa lounge by Ito Kish. Mayi is known for her enchanting art, most of which highlight doe-eyed girls. Meanwhile, the Basilisa lounge from the Ito Kish home line showcases the beauty of rattan and kiln dried mahagony. More of Mayi’s work add charm to the relaxing glass house. Amelie; Lily; Wednesday Stroll; and Emma and Momo spruce up one corner. Mayi’s siblings—JC and Tokwa Penaflorida—also also well-known artists. Learn more about Mayi and her work by following her on Facebook and Instagram. 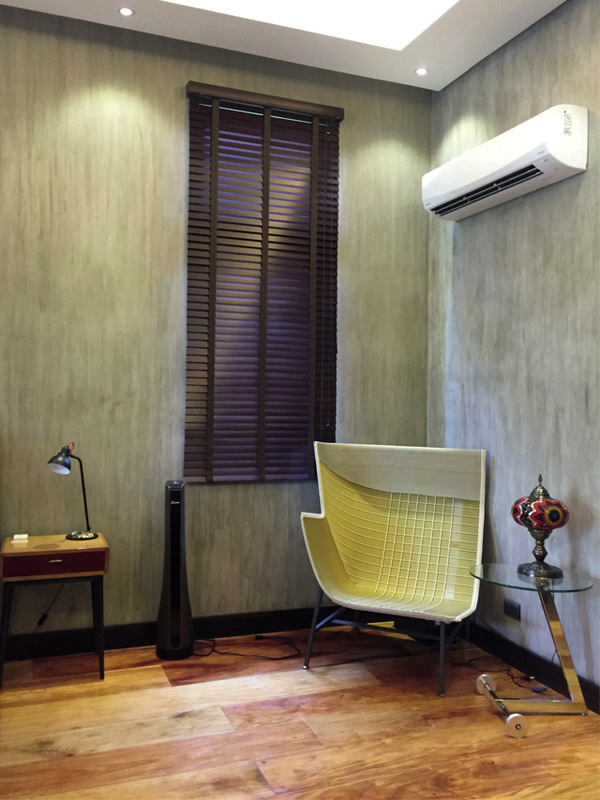 Derek’s room in the Palawan house will remind one of a posh resort suite. To complete his personal space, the actor opted for key pieces by Kenneth Cobonpue and Ito Kish. According to the designer’s website, the Yin & Yang bed features a play of opposites—solid yet transparent, random yet symmetrical. It adds to the tropical appeal of the room. Hanging above the bed is the Little People hanging lamp also by the Cebuano designer. 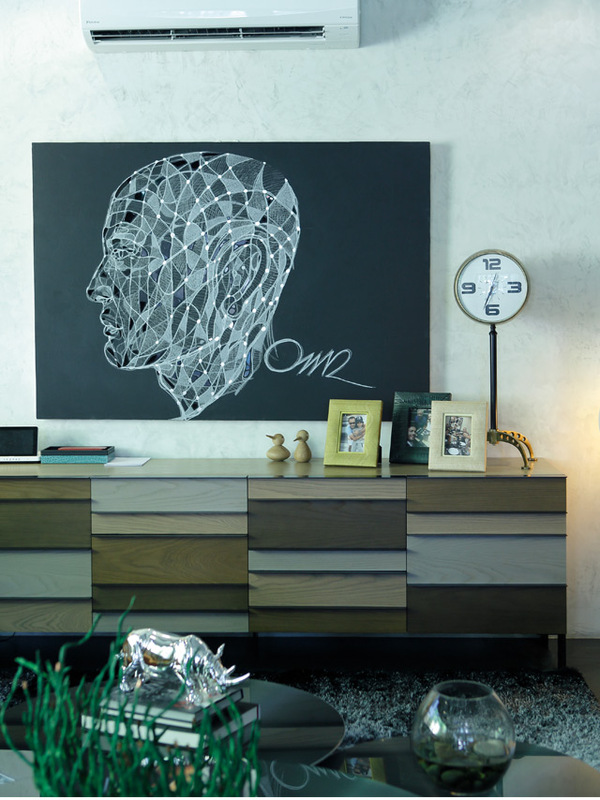 Near the glass windows are the Concesa cabinet by Ito Kish and the Suzy Wong entertainment console by Kenneth Cobonpue. Both pieces add a sleek appeal to the cozy bedroom. 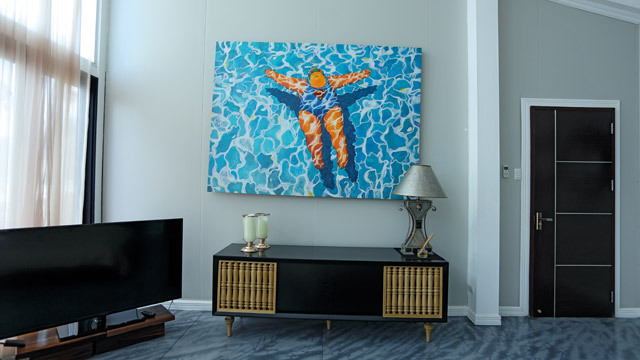 The works of art in the room are by Negrense artist Raymond Legaspi which showcase plump mermaids and another in a Superman suit. See more of Raymond Legaspi's work when you visit Finale Art File and Gallery Orange. To learn more about Ito Kish's creations, visit his website. Meanwhile, in his Alabang home, Derek chose to add elegant designer picks from well-loved brand Roche Bobois. The comfy sofa set in lively colors can also serve as an accent to the neutral-dominated space. Plush and inviting, the Roche Bobois finds are ideal for entertaining guests and enjoying lazy weekend afternoons. Roche Bobois is located at 2100 Chino Roces Avenue, Makati City. Click here to learn more. Completing the living area is Derek’s portrait by visual artist Omar Ordonez Flores from his Line Series Portraits. Other celebrities who have a similar artwork include Piolo Pascual and Vice Ganda. In Derek’s bedroom, we can instantly spot the red Bloom chair by Kenneth Cobonpue, one of the designer’s famous pieces. The pop of red works well with the neutral walls and wooden flooring. Visit Kenneth Cobonpue at The Residences at Greenbelt, Esperanza Street, Greenbelt, Makati City. Placed against the wall and near the window is the pristine Togo Sofa by Ligne Roset. It’s a welcome alternative to the sofa beds and typical chairs we often see in bedrooms. Ligne Roset’s website says it best, it’s perfect for quiet evenings. Don’t dismiss this corner yet. Sitting pretty is the Paper Planes Armchair by Moroso. The standout chair highlights a sleek design that takes inspiration from a unique fabric design based on the graph paper. The Togo Sofa is available at MOs Design, B2, 9th Avenue, Bonifacio High Street, Bonifacio Global City, Taguig.